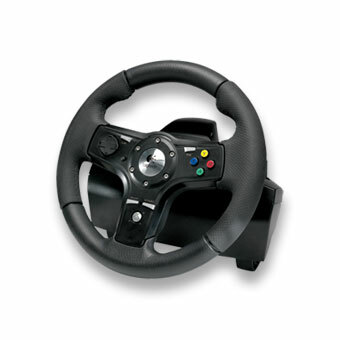 Logitech DriveFX Racing Wheel is a licensed wheel gaming companion for the Xbox 360 video game and entertainment system from Microsoft, which combines high-quality materials and advanced axial-feedback technology. The all-black wheel features two rubber grips for secure and comfortable grip, and also gas and brake pedals on a weighted base, two wheel-mounted paddle shifters, and a full set of Xbox 360 buttons for menu navigation and game setup. TeamXbox reviewed Logitech DriveFX Racing Wheel and gave the wheel overall rating of 8.4 out of 10, and concluded that “the Logitech DriveFX Wheel is a pretty nice piece, but for its price doesn’t really grab our fancy that much more than the MadCatz 360 wheel. You’ll have to pay over thirty dollars more to get the Logitech DriveFX Wheel over the MadCatz 360 MC2 unit, so it’s hard to give the “must buy” moniker to the Logitech DriveFX Wheel at this time. If the Microsoft wheel ends up biting a big one, then the Logitech DriveFX Wheel will be a frontrunner as the must-have driving peripheral, along with the MadCatz 360 MC2, and whatever Fanatec may have up their nomex suit.